Hector's dolphins and the closely related Maui’s dolphins are found only in the coastal waters of New Zealand. They are the smallest marine dolphins, growing to about 4 feet 8 inches and weighing about 110 pounds. Hector's dolphins are are classified as endangered, and their numbers continue to decline due to deaths in fishing nets and lines. The Hector’s dolphin has a well-defined color scheme. The sides and back are light grey; the flippers, fins and tail are black. The sides of the face and the eyes have a black mask, and a crescent-shaped black mark is between the eyes and the blowhole. The throat and belly are white except for a black band that joins the flippers on the underside, and a white “racing stripe” extends along the flanks. Hector's dolphin coloring is every bit as distinctive as that of a killer whale. Most dolphin species have been found to communicate using a variety of clicks and whistling noises. Hector’s dolphins have a very simple vocal repertoire consisting of short clicks with a frequency of 82 kZh to 135 kHz, and don’t use whistling sounds at all. No universally accepted theory exists to explain why Hector’s dolphins do not engage in whistling behavior. One of the most distinctive features of the Hector’s dolphin is the rounded dorsal fin that has been described as being shaped like a Mickey Mouse ear. It has a convex trailing edge and an undercut rear margin. The snout is streamlined and the forehead slopes down to the tip. The Hector's does not have the protruding beak that larger species have. A long nose helps dolphins kill sharks, but as Hector’s dolphins are comparatively small dolphins, they would not be capable of killing sharks and so have not developed the long snout. Hector’s dolphins tend to feed in groups of five to eight dolphins. Their prey include fish and squid up to a length of about 13 to 14 inches. Hector's dolphins are believed to be more interested in the size of the prey than the species. 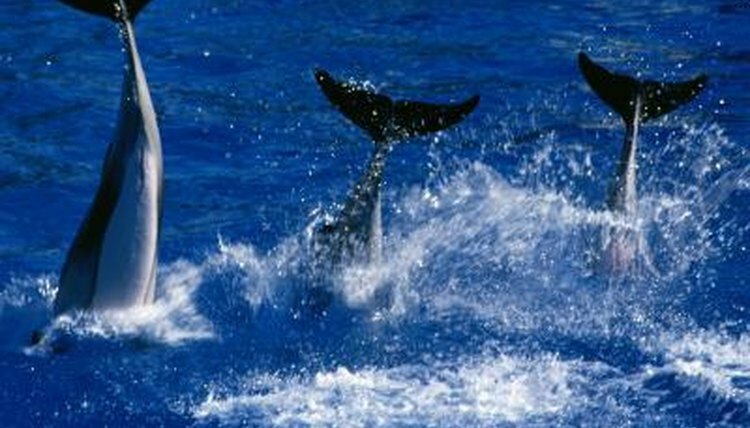 They work as a group to find and herd prey, like several other dolphin species do.